If you haven't tried any skincare products from Vichy yet, you need to stop what you're doing right now (...maybe after reading this post) and go to your local drugstore! Ever since indulging in the masking trio last year, I have been testing and adding more items to my skincare routine. Fortunately for me, Vichy has kindly been sending me their launches as they hit the market and to be honest, it's hard to choose one product I've been loving this year so I'm going to tell you about FOUR! 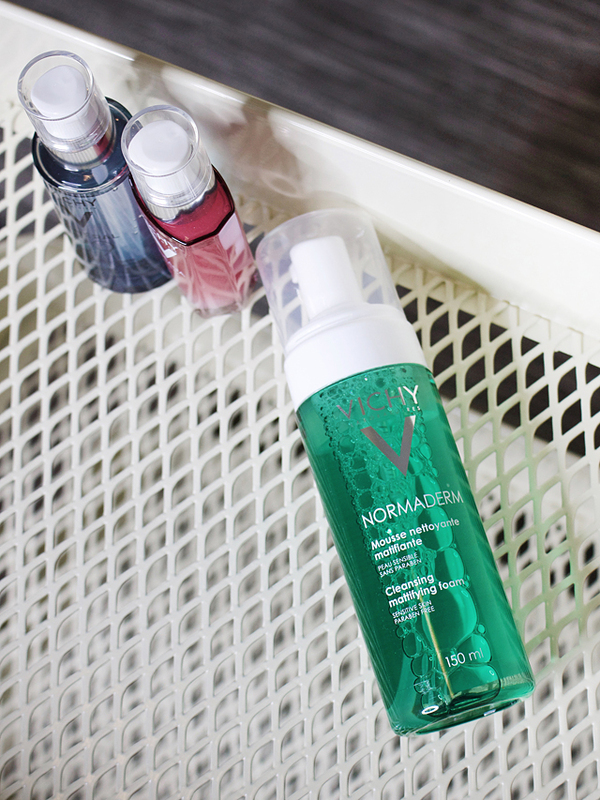 Vichy Normaderm Cleansing Mattifying Foam: While I don't regularly have oily or acne-prone skin, it is sensitive and tends to get a bit TOO shiny during the warmer months. Instead of letting it get out of control, I began using this product to see if it helps and I was pleasantly surprised! It removes excess sebum, prevents pimples, blackheads or any unwanted blemishes... wait, are they ever wanted?! I recommend using this after you shower or rinse your face with warm water as that will open up your pores and truly let the product sink in and do its thing. There are a few other products in the Normaderm collection, but I found this one to be the most useful for me this summer. Vichy Mineral 89 Fortifying and Plumping Daily Booster: I debated talking about this because it is EVERYWHERE these days and is winning awards, but for the last few weeks I've been getting a lot of compliments on my skin and I give this moisturizer 100% credit. I began using this product the day I received it in my PR mailbox, and it was mainly because I thought the bottle was pretty. It quickly became one of my favourite daily moisturizers and I love that it's not sticky or greasy. The water helps your skin breathe and the minerals are there to strengthen it even more, overall providing a healthy glow. 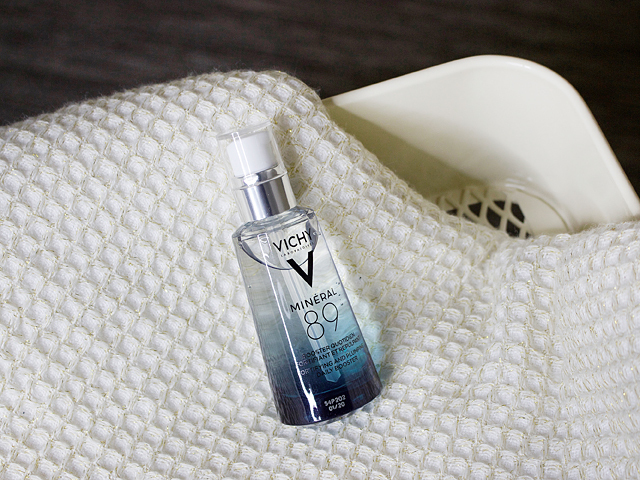 If there was one Vichy product I'd recommend you try as a first-timer, it would be this one! Now I'm not sure why it took me so long to dive into the Idealia collection; I went to an event back in the winter where they introduced the line. I was super excited, but somehow it went down to the bottom of my pile of things to try until I decided to overhaul my skincare for the summer... and I'm so glad I did. Vichy Idealia Serum: I grabbed this on a whim as I was running out of my eye cream and started to notice a difference under my eyes the next day! The dullness from staring at a computer screen all day began to disappear and now, unless I've had a REALLY long or tiring day, I find that the skin around my eyes is visibly brighter than it had been before. It is a bit sticky when you first apply it; let it sink in and do it's thing. That stickiness goes away after a few minutes and your skin will feel super smooth. Vichy Idealia Peeling (night care): You may not know this but I am extremely picky about products I use at night-time. I'm picky in general, but you definitely need to use skincare that hydrates and penetrates your skin while you sleep! This product is essentially a peel, but it does its work without you having to rinse it off! I apply it with a cotton pad before I go to bed and wash it off in the morning. Best. Feeling. Ever. It smells amazing and works on regular or sensitive skin. You can also use it during the day, but I avoid it because there isn't SPF and I have sun allergies that I gotta keep in check at all times! I hope this run-down of some of my favourite Vichy products opened your eyes to a skincare brand you might not have tried before. It could also be the complete opposite and you're already in love with these four items AND more! What is your daily skincare routine like? Let's chat on Instagram or Twitter!